For many self-employed people the attraction of setting up and trading through a limited company is that their personal affairs and the business affairs are kept separate. However when setting up a limited company and obtaining finance many directors find themselves being asked to sign a personal guarantee. Many sign that document without too much thought as to what the consequences might be. A personal guarantee is a contract whereby the guarantor will guarantee certain obligations of a third party, usually a company. The guarantee may be in relation to a loan, overdraft or some other credit facility. In simple terms, if the company takes out a loan where the director has given a personal guarantee, if the company fails to repay the loan or meet its obligations under the loan the director becomes liable to the lender. In addition to the sums outstanding it is quite normal for a personal guarantee to include an obligation on the guarantor to pay for the costs of collecting the guaranteed sum as well as interest. Ultimately the liability for the guarantor may be far higher than the amount that was owed by the company. More often than not when a company experiences financial troubles the directors will also be experiencing financial troubles. If the company is subsequently placed into liquidation the director may lose their income and then face the ominous threat from the lender in the form of enforcing their personal guarantee, often given but more likely to be long forgotten. A situation which appears to be a desperate one may not actually be so. Certain challenges may be made to the liability of the guarantor but these are not by any means straightforward and advice will need to be sought. 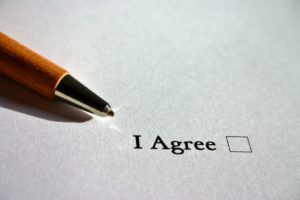 Where the terms of the guarantee are ambiguous the law will rule that the ambiguous term within the personal guarantee will be read in favour of the guarantor rather than in favour of the principle who drafted the document. Any alteration of the terms of the guarantee without the consent of the guarantor can lead to the personal guarantee being declared invalid by the court. The Unfair Terms in Consumer Contracts Regulations 1999 will apply. The demand for payment must comply with the contractual terms of the personal guarantee in order to be valid. The personal guarantee may specify a maximum amount of liability. This is the agreed maximum liability for the guarantor. The amount demanded cannot exceed this. The personal guarantee must be in writing and executed correctly. A guarantor will be released from liability if they entered into the guarantee in reliance of a misrepresentation. The personal guarantee must have been entered into by the guarantor under their own free will and not on any form of coercion. If there is any inability upon the bank to call in its loan lawfully then a guarantor may be able to avoid liability under the guarantee. When called upon to make payment under personal guarantees it is important to take advice at an early stage and not to ignore the request for payment. Guarantors should be aware that banks and lenders will often agree to accept a reduced sum in full and final settlement or instalment payments. If instalment payments are an option it is usual for the lender to require a charge over the guarantor’s property which could ultimately lead to an application for an order of possession sale in the event of a default on the repayment terms by the guarantor. We have advised many directors on liabilities under personal guarantees that they have given and been able to successfully negotiate lower settlement sums as well as avoiding litigation and potential bankruptcy. If you have given a personal guarantee which is now been called upon, I will be happy to meet and discuss the options available to you.